Vanilla Pudding: In a large stainless steel (or heatproof) bowl whisk together 1/3 cup (65 grams) sugar, cornstarch, salt, eggs, and egg yolk. Whisk in 1/2 cup (120 ml) of the milk. Set aside while you heat the rest of the milk and sugar. Have ready a fine medium-sized strainer and bowl as you will need to strain the pudding after it is cooked. First, rinse a medium-sized heavy saucepan with cold water and then shake out the excess water. (Doing this step prevents the milk from scorching.) Then pour the remaining 3 cups (720 ml) of milk, along with the remaining 1/4 cup (50 grams) of sugar, into the saucepan and bring just to a boil. Remove from heat and gradually pour the hot milk into the egg mixture, whisking constantly, until the mixture is smooth. Transfer the pudding mixture to a clean, large heavy bottomed saucepan and place over medium-low heat. Cook, stirring constantly, until the mixture thickens to the consistency of mayonnaise (about 3-5 minutes). Remove from heat and whisk in the butter and vanilla extract. If necessary, pour through the strainer to remove any lumps that may have formed during cooking. Pour the pudding into six or eight serving dishes, cover with plastic wrap, and refrigerate until well chilled, about two hours. 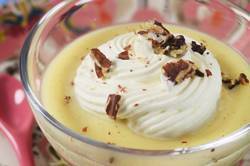 Serve warm, cold, or at room temperature with a large dollop of softly whipped cream and chopped nuts.